My standards have their roots in John Nehrich's article Upgrade your freight car fleet in the December 1991 Model Railroader . This originated at the Rensselaer Polytechnic Institute's model railroad club, where a major modeling goal has been to recreate historic scenes and atmosphere from the 1950s. The best of their fleet was marked with a Green Dot painted on the underside; less accurate models received a Tan Dot. Proper operation: couplers, wheels and trucks checked for proper performance and conformance to NMRA standards. Era-appropriate car types and paint schemes. This can be extended to re-weigh data and marking, but I haven't gotten to the point where I'm re-stenciling cars. Era-appropriate trucks, brakes and other details: At various times since the 1930s, AB brakes replaced K brakes, arch-bar and Fox trucks were banned from interchange, plain bearings were banned in favor of roller bearings, roofwalks were removed from house cars, etc. Separate grab irons and steps, rather than the heavy, molded-in details found on many commercial models. End detailing, including lettering, separate ladders, tackboards, placard holders and good looking handbrake parts. In the future I may extend this to coupler cut levers, air and steam hoses as necessary etc. No doors with conspicuous claws or oversized tracks; better they don't open at all. Roof detailing: scale thickness running boards, any roof doors and hatches modeled accurately and roof painted (or not) per the prototype. Window shades and diaphragms on passenger-carrying cars. Underbody detailing: Visible brake equipment and tankage should be modeled. I don't aim for cars that look perfect when turned upside down, just for what should be visible as a train goes over a trestle. Weathering: Road dirt and/or soot on the underbody, ends, side and roof. Cargo spills on covered hoppers and tank cars. Lading debris, dirt and rust in gondola interiors. Rusty open hopper interiors. Dusted-on weathering should be protected with some kind of clear coat, lest it be removed by handling. 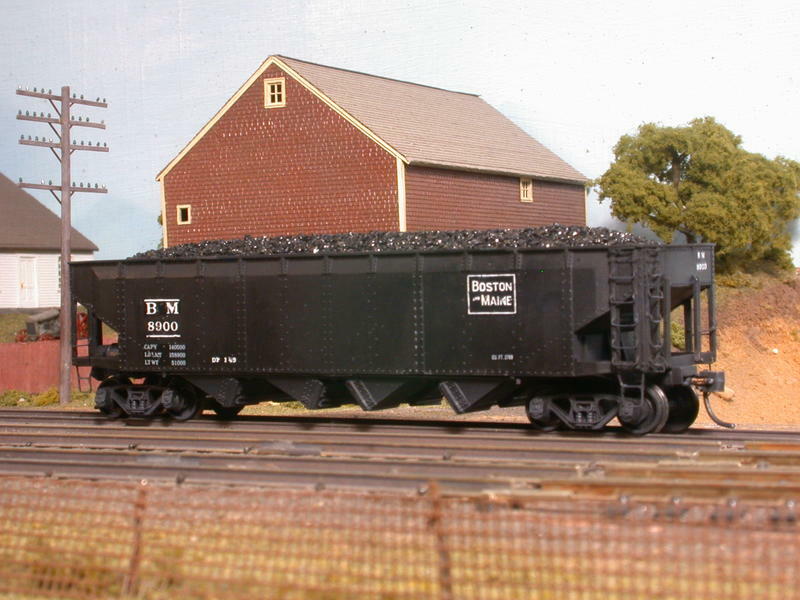 Stock Athearn Blue Box boxcar from kit. The same Athearn kit, custom painted, decaled and weathered. Intermountain AAR 1937 boxcar kit, assembled, lightly weathered. Trains-Miniature (Walthers) RTR X-29 boxcar with door claws trimmed, running board thinned and airbrush weathered. Red Caboose X-29 boxcar kit, assembled and airbrush weathered. Stock Athearn Blue Box quad hopper from kit, weathered. Athearn quad hopper, brought up to Green Dot standards: Grabirons and steps made from brass, a better brakewheel, brake trainline and piping added, etc. Bachmann RTR 10-1-2 Pullman, improved by replacing the steps, rearranging interior partitions and adding window shades. Branchline's kit 12-1 Pullman came with separate grabs, a realistic diaphragm and air/steam hoses. Here I added window shades and weathered it lightly. Over the past ten years, assembly of model railroad equipment in China has become routine, even for models that were originally US-made kits. The high-end injection-molded kits shown above are mostly found as old stock in stores and at train shows. But molded-on grabs and unrealistic doors and running boards are still common on most manufacturers' inexpensive cars. And inaccurate, imaginary and era-inappropriate paint schemes abound. Not everyone sees their equipment from this perspective, and I've had plenty of fun operating railroads where it isn't a priority. But if you want it, it isn't nearly as much effort to achieve now as it was when the RPI club members and other pioneers were active in the 1980s and 1990s.